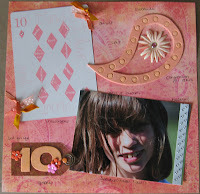 This is another layout using Crop Addict's June kit. The patterened paper is thick enough that I didn't have to mat it on anything. I used chalk to rub over my chipboard pieces (after I painted them) and to color my flower. It also gave it a little shimmer to go with my little rhinestones. The tag was made using the polished stone technique. I also used several supplies besides the kit.